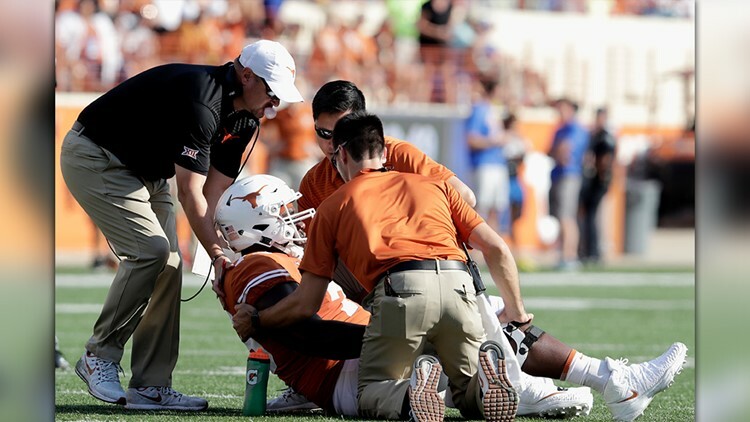 Head coach Tom Herman of the Texas Longhorns assists members of the training staff tend to Patrick Hudson #73 of the Texas Longhorns in the fourth quarter at Darrell K Royal-Texas Memorial Stadium on September 9, 2017 in Austin, Texas. AUSTIN — Longhorns offensive lineman Patrick Hudson is out of the hospital and back in classes after having his body temperature get too high during practice on Sept. 6 before Saturday's game against Tulsa. He went to the hospital on Sept. 8 after a team of medical staff members couldn't get his temperature down to normal levels. He spent a day in intensive care, but Head Athletic Trainer for Football Anthony Pass said, "Patrick Hudson has been released from the hospital and will return to classes on Thursday. As of now, no timetable has been set for a return to physical activity." Hudson is a sophomore out of Silsbee who only played in two games in 2017 before suffering a season-ending injury against San Jose State.